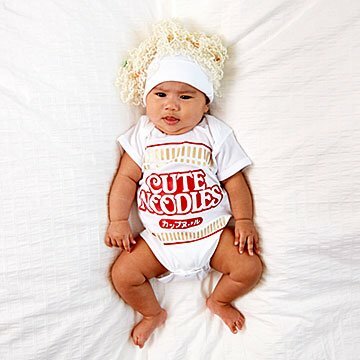 You can instantly see how deliciously silly this soft cotton ramen babysuit and hat will look on a tot. It'll be a long time before baby's slurping ramen while cramming for freshman finals. But in this this adorable babysuit, they'll look instantly, Instagram-ably delicious. Hand pressed onto super-soft cotton babysuits, maker Amy Kuhn's playful graphics make tots look like a package of the classic Japanese snack, with oodles of noodles—complete with felt carrot, onion, and egg bits—on their little heads. Years from now, after they ace their exams, reward them with a trip to the CupNoodles Museum in Yokohama. No, we're not kidding. Handmade in McLean, Virginia. A passion for food, a love of design, and a newborn son to dress up like a bottle of hot sauce—these three things made Amy Kuhn into the babysuit master she is today. (Strangers who asked the inevitable "Where can I get that?" played a role, too, we guess.) Her tiny outfits are designed to add a little zest to everyday life, creating memorable family moments with all the sugar and spice you've come to expect from your favorite edible treats. And on top of that, they're simple to put on... since being a parent is already tough enough. Wash babysuit inside out with gentle cycle. Hand wash hat.